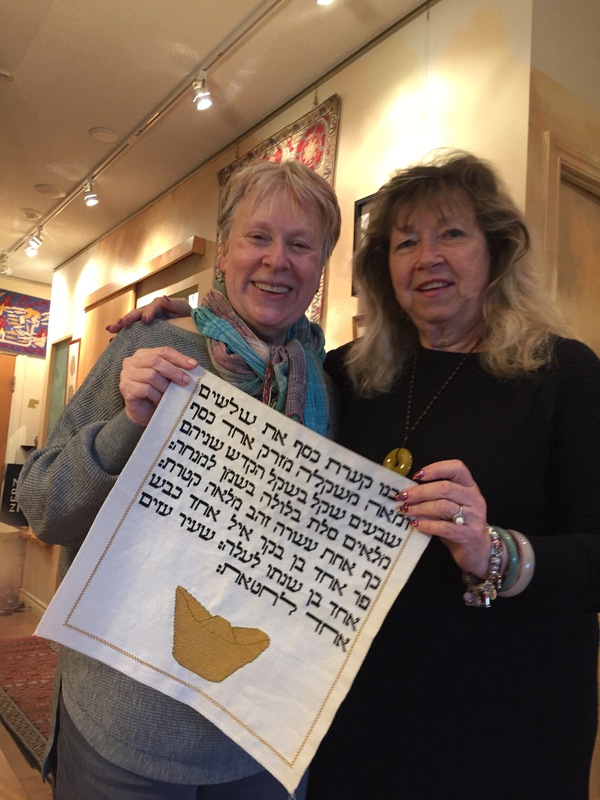 On a rare and beautiful weather winter’s day in downtown Toronto, Arlene and I made our way to deliver our stitched canvas panels to Temma Gentiles, the visionary and tireless volunteer of the project, TorahStitchByStitch.org. We met this great fabric artist and had a lovely chat, telling her how we came to do the stitching and what it meant to us. Arlene and I, proud as peacocks! It was wonderful to meet the genius behind the project, who works tirelessly to make everything run like clockwork. There’s so many stages to the project that require thousands of emails every month. 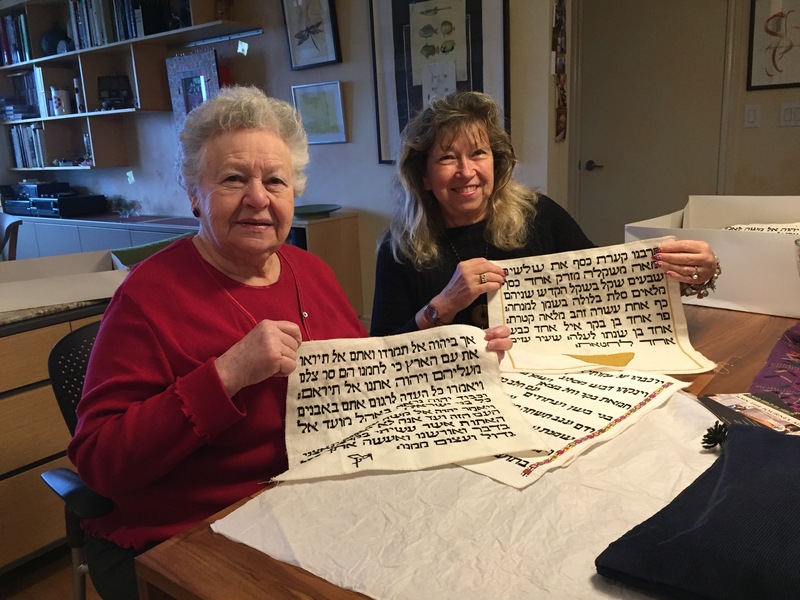 Everything from seeking out volunteer stitchers, preparing and sending out the kits, assigning helpers to give a hand during the stitching phase, binding all the finished panels, and preparing and printing a book that documents all the stitcher’s works. With many events in the planning stage to display the works, this project is coming around the corner to the finish line! I received this email message from one of the volunteers and excitedly found out that, YES! my panel has been accepted: “Just a quick note to thank you for your completed canvas. 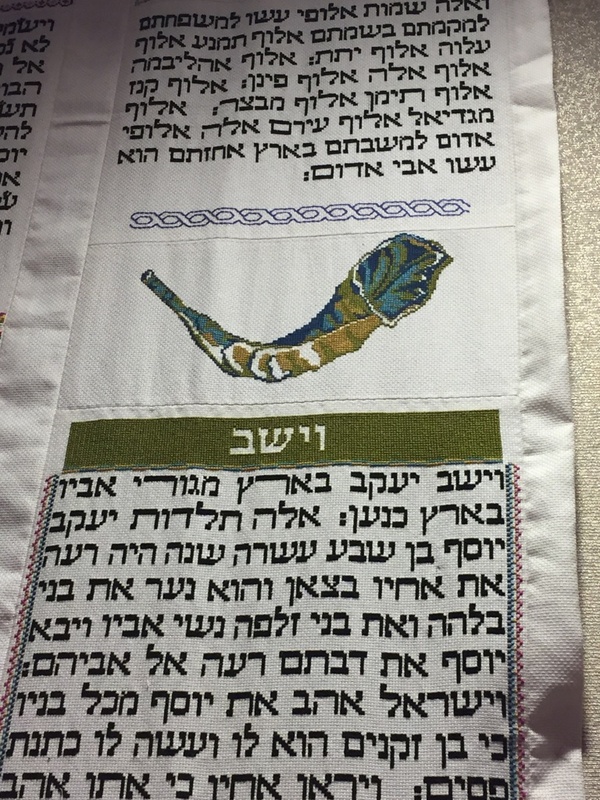 We are glad that you enjoyed this stitching project and found it so meaningful. 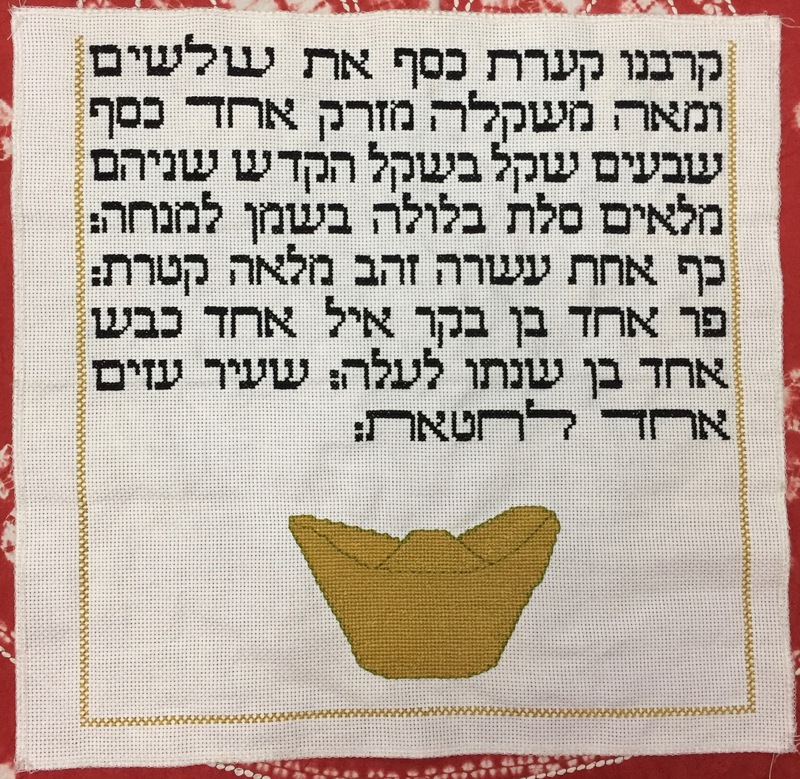 Contact TorahStitchByStitch.org to volunteer to stitch a panel. 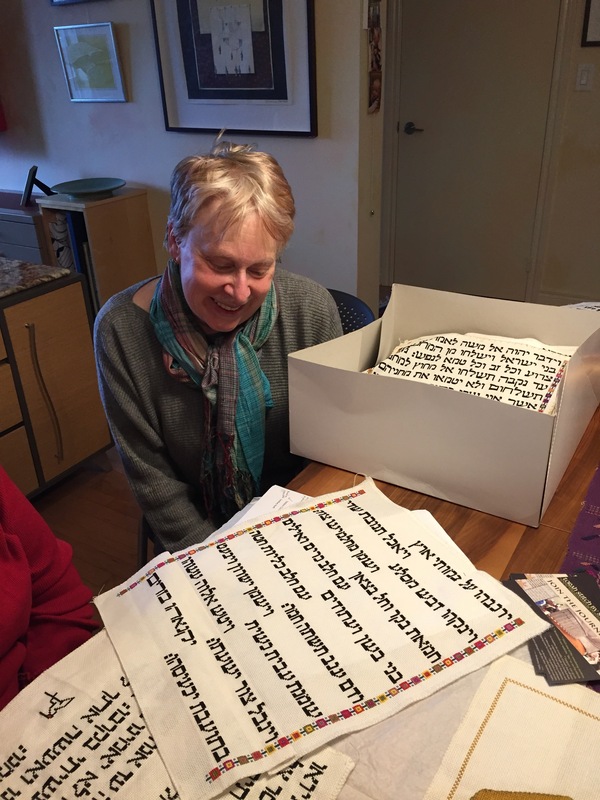 As you can tell, I am beaming with pride to be a part of this great stitching of the Torah scriptures and look forward to seeing it all hanging on a wall in some auspicious place! 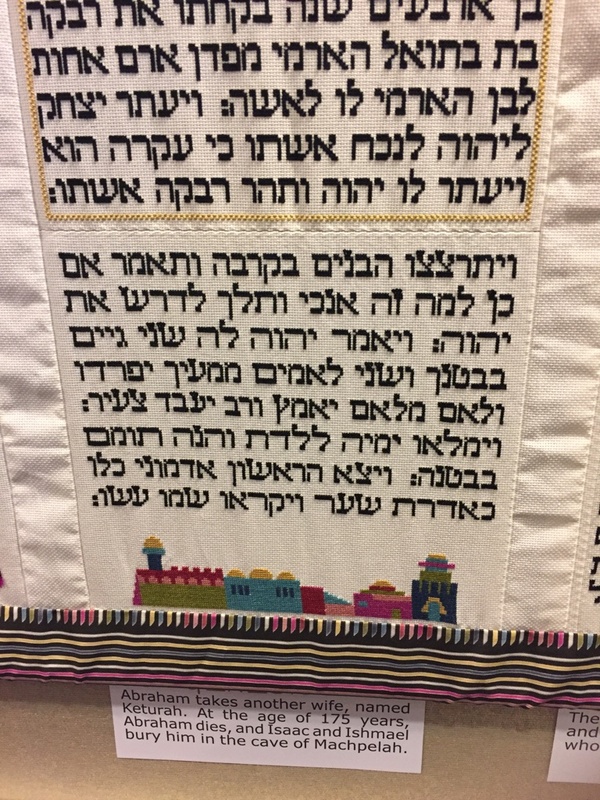 My friend invited me to a synagogue to see some wonderful needlepoint and to a listen to a presentation by her sister-in-law. 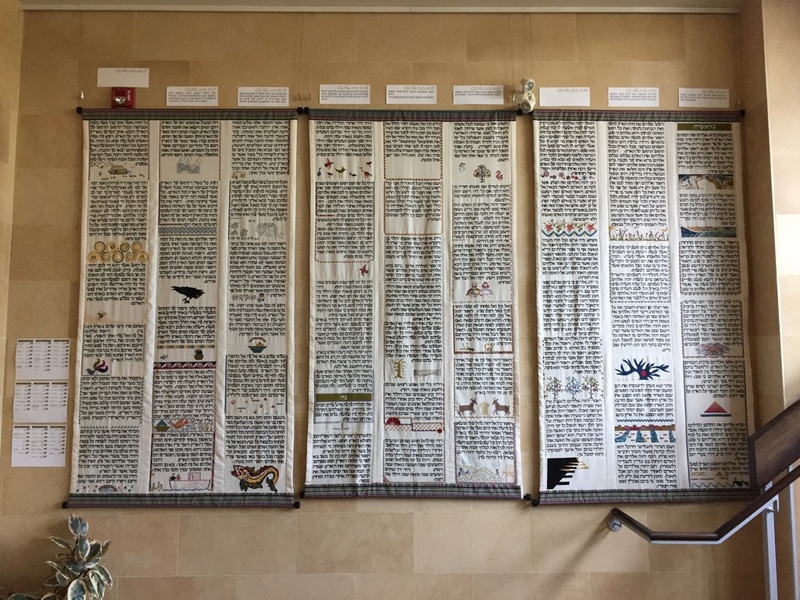 I was immediately drawn to photograph the huge project hanging on the walls of the huge room in the synagogue. 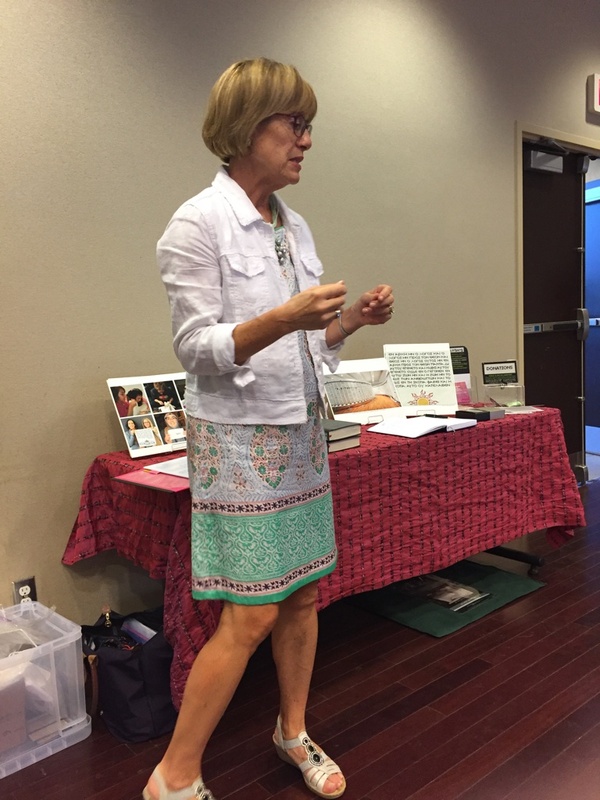 Being an avid crafter all of my life, embroiderer, crocheter, knitter, sewer, quilter, scrapbooker, miniaturist, sketcher, painter and artist, it would come as no surprise that I was mesmerized by the project that was before my eyes. 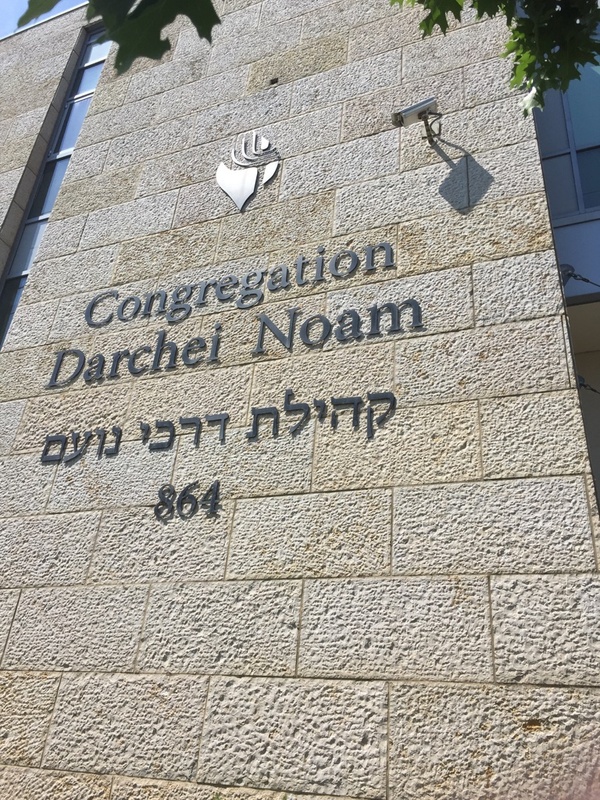 Having never participated in Shabbat services (even when living two short blocks from a synagogue for several years) I do not consider myself to be religious in any way. 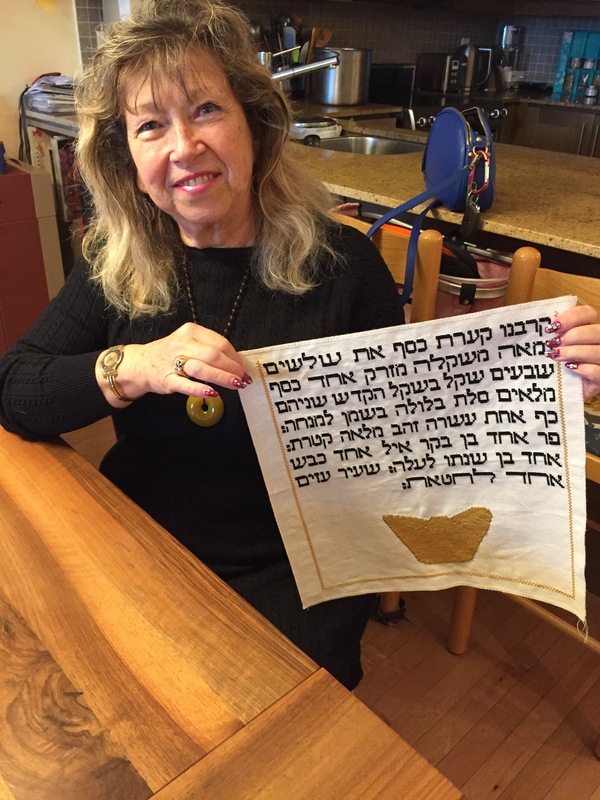 But if a Jewish holiday is coming up, I always prepare a lesson and a craft or cooking activity in class about that holiday. I do possess knowledge of the religious and historical significance of most of the holidays and avidly cook traditional food that I serve during them. 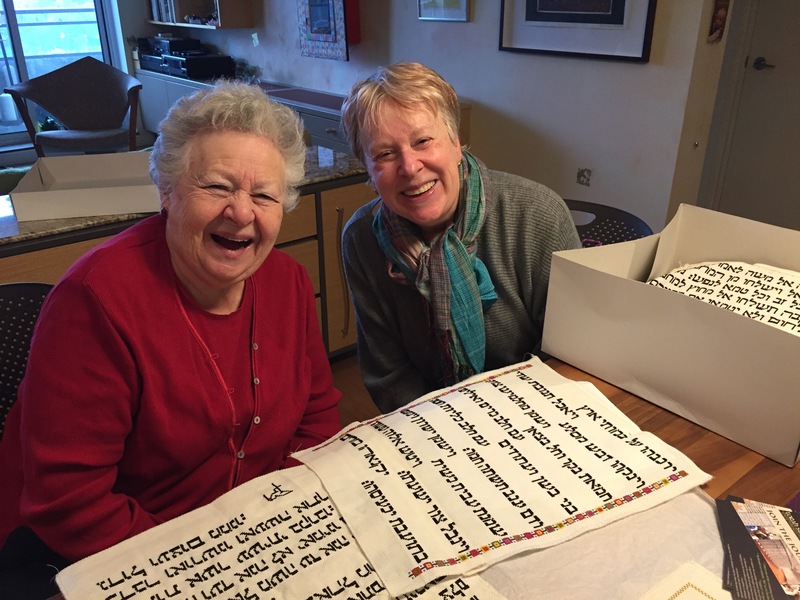 To me, it’s all about bringing family together to celebrate Jewish tradition, but not in the pure religious manner. 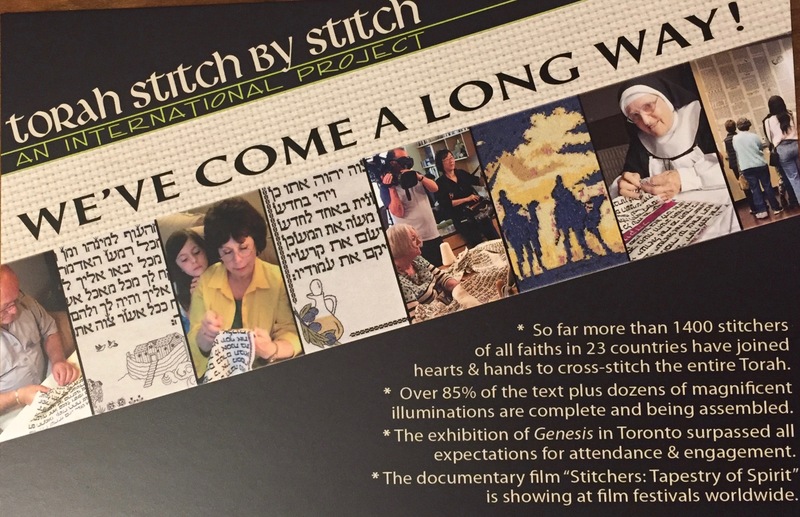 One spin off is being a part of something much bigger than just doing some cross-stitch. 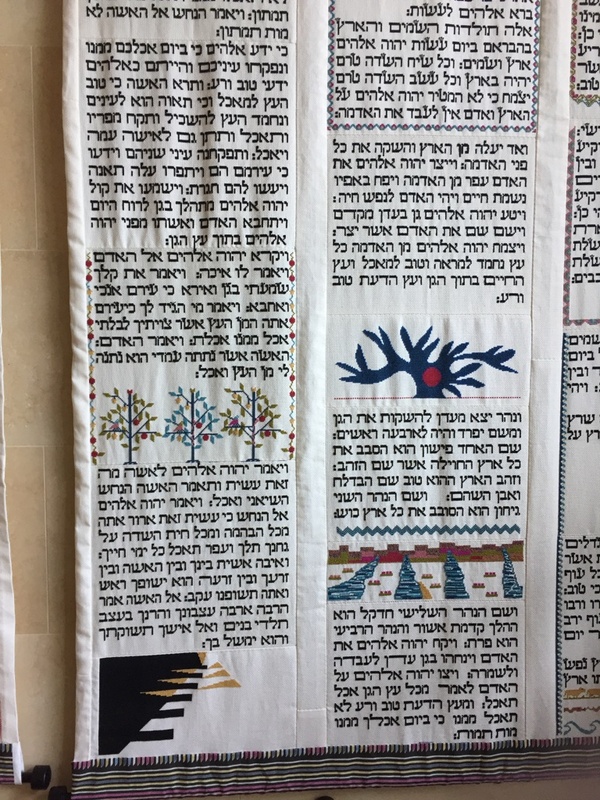 Imagine I’m part of a worldly group of thousands and cross-stitching the Torah in Hebrew, including: an agnostic Jewish woman, a Mormon fire chief, a Muslim immigrant from Turkey and a Mother Superior at a church in the English countryside to mention just a few. 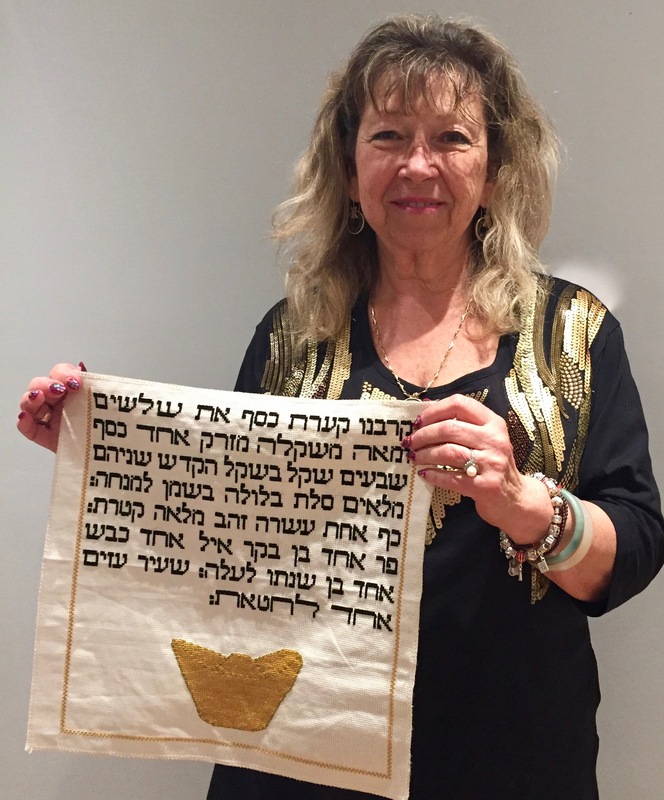 During the presentation, I was enlightened to the Torah containing 5 books, being: Genesis, Exodus, Leviticus, Numbers and Deuteronomy. What I had seen on the walls was only the first book. They needed more than 300 more volunteers. I was in! 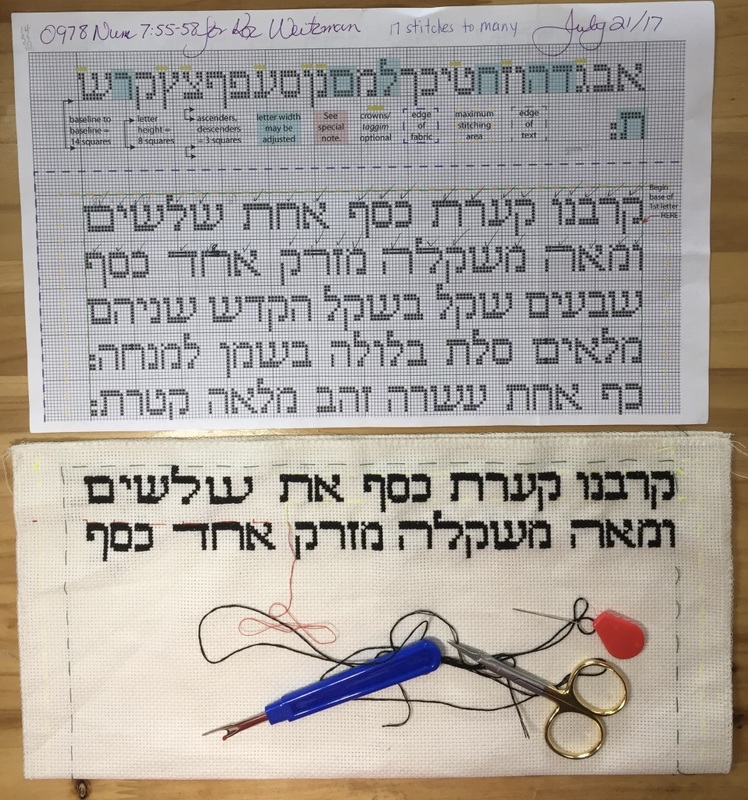 Signing up to cross-stitch a portion really did surprise me though, but looking back, I thought it was inspiring, a way to go back to my Jewish roots, participate in a huge project and do my share, along with create something so meaningful and do some handwork, something that I hadn’t done for many years. I was so eager to get into the work and dug right in. I thought it was good enough to baste the borders on the cloth! Then stitch, rip out, stitch, rip out for the first row and part of the second. Humm! So much ripping out and I was going to run out of thread. I hadn’t carefully read the instructions, helpful hints or tips and at first I thought I had failed. Well, failure is not a word in my vocabulary. So I decided that I’d better be a ‘good student’, I went to do my research. First line ripped out several times! 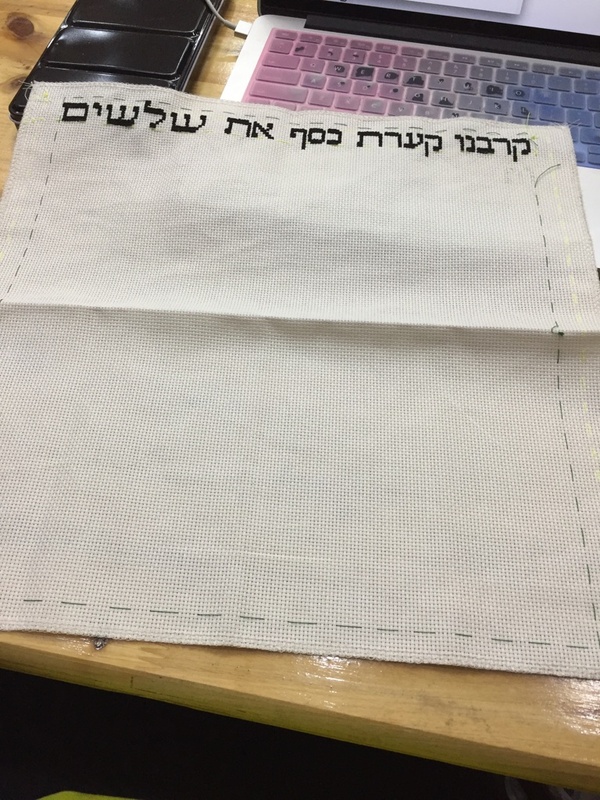 After the first week of stitching and I have finished 2 complete rows (5.5 more rows to go)…and I think it looks pretty good! 2 lines finished in the first week! My portion is Numbers 7:55-7:58. It is part of the story of an outsider from another country who has an affair with the wife of the Israelite leader at the time. 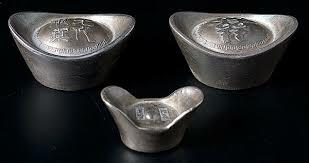 This causes a war between the countries. The Israelites win and the punishment is that the outsider must pay retribution in the form of one silver charger of the weight of an hundred and thirty [shekels], one silver bowl of seventy shekels, after the shekel of the sanctuary; both of them full of fine flour mingled with oil for a meat offering, one golden spoon of ten [shekels], full of incense, one young bullock, one ram, one lamb of the first year, for a burnt offering and one kid of the goats for a sin offering. 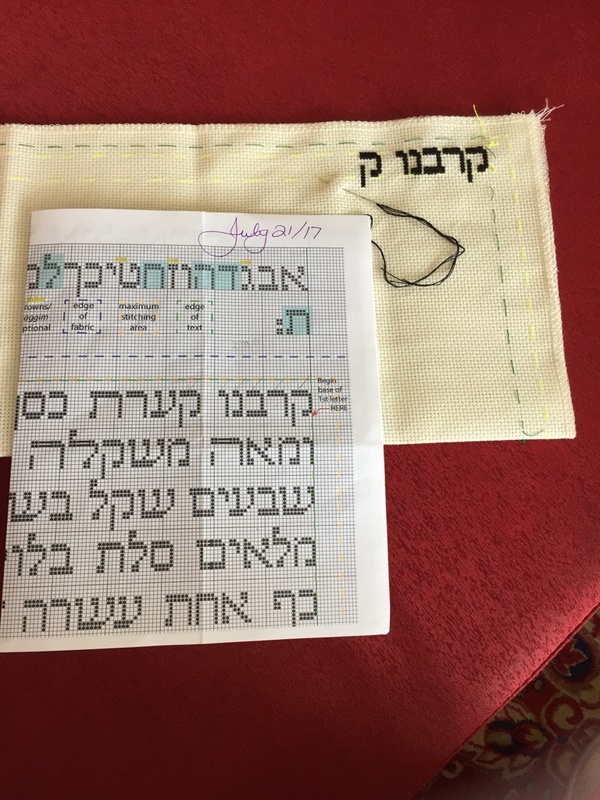 My portion is short and leaves a large portion at the bottom of the aida cloth which is big enough for an illumination (illustration) for embroidering. 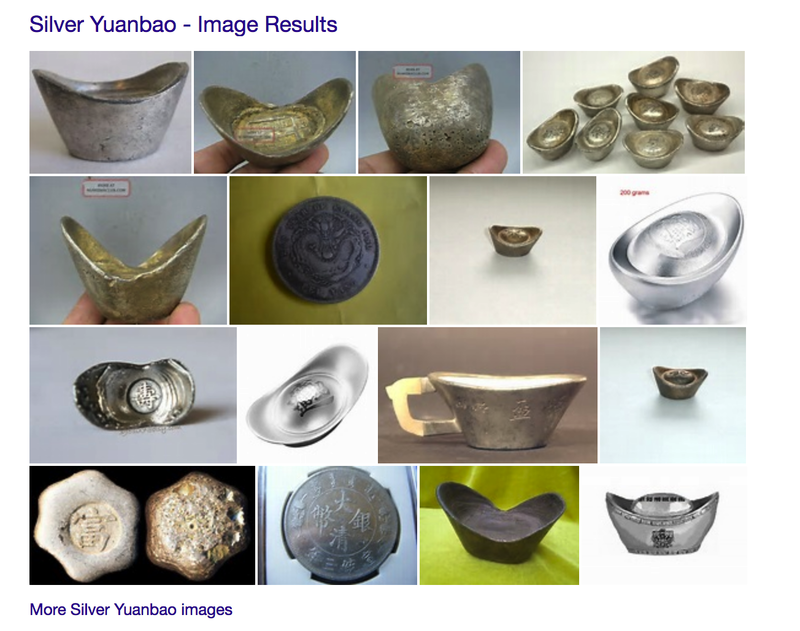 Being in China while doing this stitching, I am thinking that I may embroider a yuanbao, which is ‘boat-like’ type of silver or gold ingot currency used in imperial China. Since the illuminations are limited to 5 colour choices and grey or silver isn’t one of them, I’d have to get creative! If I don’t finish in 6 months I won’t kill myself, but I certainly will think about it…haha@! 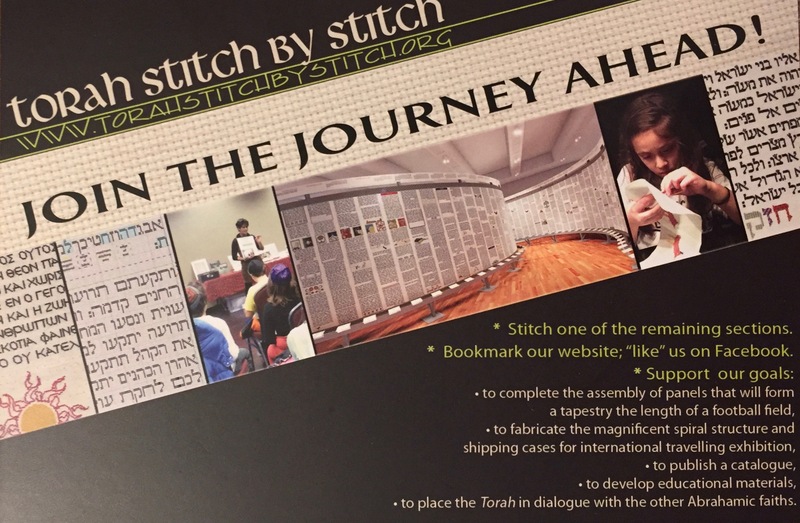 For more information on how to sign up to stitch, or to visit the exhibit at Darchei Noam in Toronto, visit torahstitchbystitch.org (mention my name and they’ll mail you a kit).